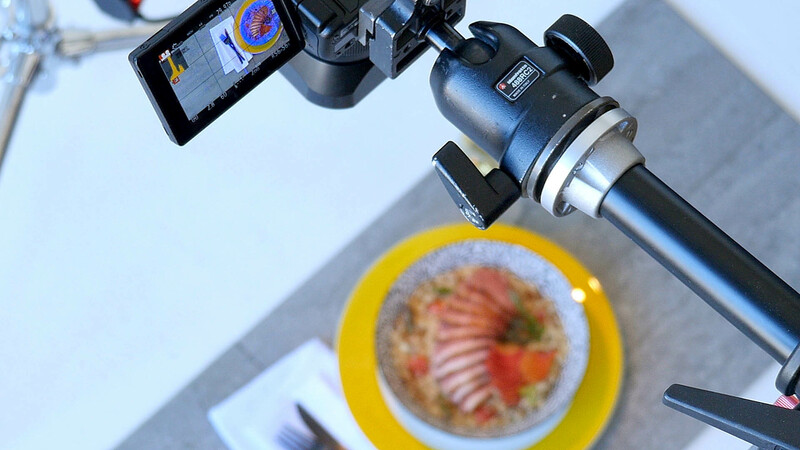 Seeing behind the scenes of a photo shoot or a video shoot is always fun and interesting, filming the behind the scenes video of a food photo and video shoot is even more fun and interesting. Food photography and video production can require quite a few people and this Montreal studio was full of all kinds of people for this food photo video shoot. Chefs and food stylist, photographers / cinematographers, photo stylists and photo assistants and spectators. The chefs and food stylists were preparing the food while the photographers / cinematographers and stylists and assistants set up the camera and lighting gear and prepared the set. This was probably the first day I filmed all day with my Panasonic Gh4 camera and it was great. I didn’t even have to change the battery. A Panasonic GH4 was also used to photograph and film the food and it worked great too. This food photo video shoot was a lot of fun and we took some great photographs and filmed some great video of food and hopefully everyone will think a pretty good behind the scenes video as well.